One of the more overlooked components of the AR, properly functioning springs are vital to the platform’s performance. Springs in the buffer assembly, bolt group and trigger group are important to maintain. Proper care and ensuring functionality of those go a long way in ensuring reliability. The “buffer” or action spring has a large surface area which needs lubrication. Extractor and ejector springs in the bolt group need to be maintained. Three springs in the trigger group — trigger, hammer and disconnector — require care. Springs are important, but often overlooked, parts for the AR. There are a lot of options out there, and not all springs are created equally. Choosing the right springs ensures reliability for your AR rifle or carbine. For this discussion, we’re going to focus on the springs related to three important areas: the buffer assembly, the bolt and the trigger group. There are two basic “buffer” or action springs. The spring for fixed stocks is around 12½ inches in length. The carbine spring, for ARs with adjustable stocks, is shorter, at about 11 ¼ inches long. (Buffer springs can vary up to about a half-inch in length.) For a “fighting” AR — self-defense, law enforcement or field use — I prefer standard Mil-Spec springs, which are made from round wire. There are other options out there, such as “universal” springs that use one length spring for fixed and adjustable stocks. These springs often increase the spring pressure, making it difficult to cycle the action efficiently. I also don’t like springs made from flat wire. They create a lot of friction and wear in the extension tube. Unless you’re fine-tuning an AR for a specific application and ammo, Mil-Spec is the way to go. The buffer spring is a large friction surface and needs to be lubed. Cycle the charging handle. If you hear/feel a gritty action from the buffer spring, it needs lubing. Remove the spring by pressing the buffer detent — at the front of the extension tube on the bottom — down and pulling the buffer and spring forward. Clean the spring and inside of the tube, then lube the spring. I use SLIP 2000 EWL. Reinstall the buffer and spring, cycle the charging handle a few times, and you should hear and feel a difference. The bolt contains two springs — the extractor and ejector spring. During firing, the extractor pulls the empty case from the chamber, or, when unloading, it extracts a loaded round, and the ejector kicks it out. The extractor spring provides the tension necessary for the extractor to hold the cartridge case. Too little pressure and the extractor slips off the empty brass as it tries to pull it from the chamber. However, an extractor spring with too much pressure will cause feeding problems. The round will have trouble slipping under the extractor, or the extractor will damage the rim on the brass as it’s chambered. (Note: Steel-cased ammo will cause accelerated wear with your AR.) I feel safe saying this is the most important spring in the AR. It took Colt more than 35 years to work out the proper spring weight on the extractor for the carbine. During this time, there were lots of different aftermarket extractor springs developed in order to correct this problem. There were also other “fixes,” like O-rings and wedges, to strengthen the existing extractor springs. None of these work well. Today we have Colt Gold extractor springs. Colt spent a lot of time and money researching and developing this spring. The Gold spring, which actually has a copper color finish, will ensure proper function and longevity. The ejector, with its spring, kicks out empty cases. Again, this spring can be too heavy or light. An ejector spring that’s too strong causes feeding problems, making it difficult for fresh rounds to slide in behind the extractor when chambering a round. If the ejector spring is weak, you’ll experience failures to eject empty cases. To test the ejector spring, use your fingernail and moderate pressure to press it into the bolt. During live fire, empty cases should eject a few feet and back at about 4 o’clock. If it’s ejecting in front of you — 2 to 3 o’clock — it’s time to replace the ejector spring. A spring that’s too strong will kick cases 10 or 12 feet out. With both the extractor and ejector spring, you’re looking for “just right.” I use Colt springs from Brownells. I know these are high-quality parts that are truly Mil-Spec. One reason the extractor and ejector springs fail is due to heat. After extended firing, lock the bolt open. This prevents heat from transferring from the barrel extension, the rear of the barrel where the lugs are, to the spring of the bolt and will extend their life. The AR trigger group has three springs — trigger, hammer and disconnector. The design is simple and reliable, unless you start messing with spring weights or install them incorrectly. There is a big trend today for shooters to install lightweight springs in order to improve the trigger action. This can lead to trouble in several ways. Remember, under stress — lives depend on your actions — your fingers lose dexterity and feeling. A 3-pound trigger will “feel” like 3 ounces. In defensive or combative applications, a match, competition or lightweight trigger will lead to negligent discharges. This is unacceptable. Light hammer springs cause light primer strikes. This will be trouble with Mil-Spec or imported ammo, which usually have harder primers. On the range or during a match, a light primer strike is embarrassing. In a fight, it could be tragic. I would also avoid lightweight disconnector springs. 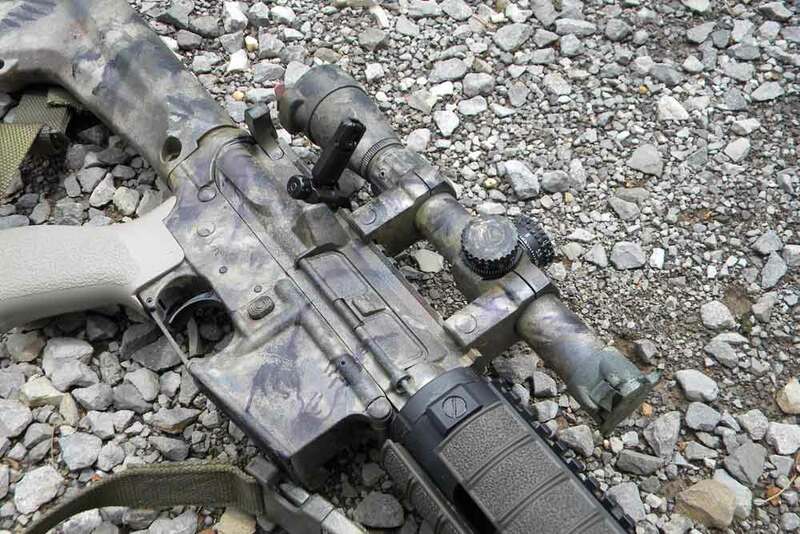 A disconnector spring that’s too light leads to the AR “double tapping,” firing off rounds as the bolt seats into battery and the hammer jumps forward. Sometimes it will cause your AR to go full auto. (Colt modified the AR’s bolt and hammer, creating an “interrupter” to prevent this from occurring.) When it comes to the trigger group, stick with Mil-Spec springs. The proper positioning of the hammer spring seems simple, but I see a lot of problems with them installed improperly, especially with home-built ARs. The legs of the hammer spring provide the force necessary to ignite the primer. If the hammer spring is positioned on the hammer improperly, you’ll have light primer strikes. The hammer spring’s legs also hold the trigger pin in place. If the spring is weak, had one leg shortened/cut or it’s installed improperly, it allows the trigger pin to walk out of the receiver. This can cause negligent shots and full-auto fire. If the pin walks out of the receiver, it can also allow the hammer to fall when the AR is set down, bumped or anything else that jars the internals enough for the hammer to slip. There have been people killed by ARs because of this. If you’re not sure about what you’re doing, get a qualified gunsmith to do your AR work. This is not something you should be experimenting with. The AR is a great firearm. This platform has been in service with our military since the mid 1960s, with no retirement in sight. With the right parts installed correctly, it will provide you with years of reliable service and be something you can pass on to future generations. Editor’s Note: This “AR Essentials” column is an excerpt from the Fall 2017 issue of Gun Digest the Magazine.